At Red Bud Dental we make every effort to keep your dental appointments convenient and effective. We don’t want you to have to schedule numerous appointments, just to achieve one dental treatment. We also don’t want you to have to miss work in order to make your dental appointment. We will do everything we can to fit into your busy schedule. We understand that your life is full of juggling work and extracurricular activities. Balancing your to-do list can be hard than balancing your checkbook. To help you fit dental care into your schedule, we are open Monday through Friday from 7am–7pm. Now, you can make dental visits fit around your active lifestyle! Schedule a convenient dental appointment before or after work or around your child's school and extracurricular activities. 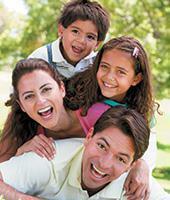 Dental appointments can be challenging for large families. You have to plan around each family member’s schedule, and you may have to find childcare. To help you schedule family-friendly dental appointments, Red Bud Dental offers family-block appointments. Family-block appointments are dental appointments that are scheduled back-to-back so that your entire family can be seen at the same time! Your family and your time is important to us. We want to work around your schedule. In the past, it was common for patients to have to schedule several dental appointments to ensure they received proper dental treatment. We make sure that dental treatments like fillings, crowns, exams, and cleanings can all be completed in one visit! We also have specialists come to our office to treat you, so that you don’t have to be referred out of the office. Now, you can have procedures like implants and surgical extractions done at one office! We do our best to finish all dental treatments in as few visits as possible. If you would like to have several dental treatments completed on the same day, let us know, and we will do our best to accommodate you. While we can complete several dental treatments in one visit, your comfort and safety are our priority. We will only complete dental treatments that can realistically and comfortably be completed in the time allotted.